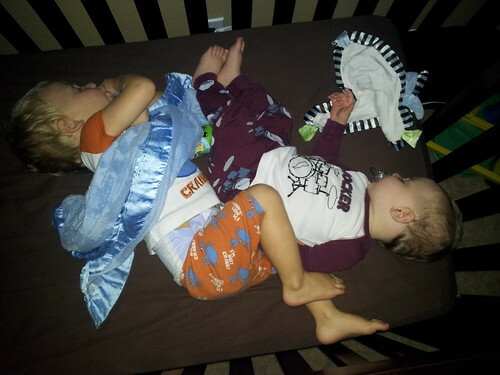 These brothers are inseparable. Any time little man is upset about anything instead of crying for mommy or daddy, he cries for his brother. Little man does not like being without his brother. 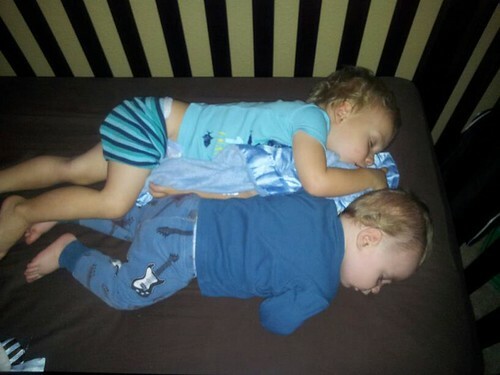 They have shared a room together since Cohen was just a few weeks old. Every night before hubby and I head off to bed we check on them. In the past few weeks when we go to check on the boys this is what we have found. Isn't this the cutest? Friends will often ask if we let me continue to sleep together, and for now the answer is no. We will gently move little man back into his bed where he sleeps until he wakes up in the morning. Then he climbs back into Cohen's crib. We will usually hear on the monitor little man say, "Hi, Cohen." The love doesn't stop there. They sit next together in the car. It is not unusual to look back and see little man reach over into Cohen's car seat and hold his hand. He's been doing that since Cohen was just a few weeks old. I love the love these boys have for each other. The past few evenings Cohen has been hypersensitive. We'll try to talk to him and he starts whining or crying even while holding him. He'll cry and then stop to open his eyes to see who is watching. It's the kind of thing you want to get on video so you can show him when he's 10. So I was trying to get a video of it for our personal records, not intending to put it on the blog. But while making this video his emotions took a different turn and it further demonstrates the point of this post. Nobody can make Cohen laugh like his brother. Love these boys!! Aww that is just too cute! I'm so glad your boys enjoy each other. I'm sure it's fun to watch them. My 3 year old granddaughter loves to hold her brother that's 7 mo and they just giggle together! Thanks for sharing! wow that post was so cute! i love the video, it actually made me cry. i love that they are such good friends. his little face is just darling. have a great day with your adorable little boys. they are blessings.